Because this blog is pretty well-trafficked, people with something to promote often try to grab my attention—I get invited to movie screenings and plays; I get press releases about anime conventions and human-rights fundraisers; I get sent pairs of underwear to review. (Seriously. No. Seriously.) But because I'm almost always immersed in writing scripts or reading scripts (or compulsively watching past seasons of Hell's Kitchen), I often turn things down. 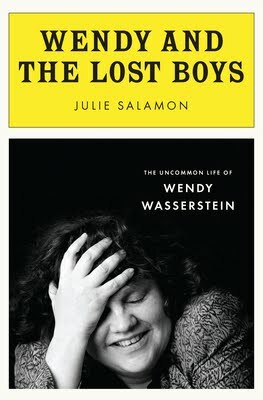 So when a publicist offered to send me an advanced copy of Wendy and the Lost Boys, an epic (anything over 100 pages is epic to me) biography of Pulitzer Prize-winning playwright Wendy Wasserstein, I naturally had to say no. But something in the press release caught my eye: the book was written by journalist Julie Salamon. So I gave the publicist my mailing address and agreed to review the biography. The Devil's Candy is not so much a takedown as it is a cautionary tale and a look at how artists—actors, directors, costume designers, editors, etc.—navigate through vicious terrain simply because they love what they do. Which brings us to today. The day I'm supposed to post a review of Wendy and the Lost Boys. It's been a month since I've had the book, maybe two...and I haven't even opened it. It's not that I don't want to. I mean, if The Devil's Candy provides a wealth of knowledge about the film industry, this biography certainly provides invaluable information about theatre, a world that I know and love and would welcome knowing and loving more. But, obviously, I can't write a review. All I can do is tell you that I saw a small production of Wasserstein's An American Daughter many years ago in the San Francisco Bay Area, and I've used excerpts from that play in my playwriting classes. I can also tell you that Wasserstein wrote the screenplay for the underrated Paul Rudd/Jennifer Aniston comedy/drama The Object of My Affection, based on the gay man/straight woman novel by Stephen McCauley. The film is an astute exploration of modern-day friendships and an excellent showcase for Rudd and Aniston's more subtle comic acting. As for Wendy and the Lost Boys, I hope to post a full review soon. And by soon, I mean check back next year. You see, it's easier to put on a pair of underwear than to read a book.